Provides tools to generate an HTML interface for creating adaptive and non-adaptive educational and psychological tests using the shiny package (Chalmers (2016) ). Suitable for applying unidimensional and multidimensional computerized adaptive tests (CAT) using item response theory methodology and for creating simple questionnaires forms to collect response data directly in R. Additionally, optimal test designs (e.g., "shadow testing") are supported for tests which contain a large number of item selection constraints. Finally, package contains tools useful for performing Monte Carlo simulations for studying the behavior of computerized adaptive test banks. 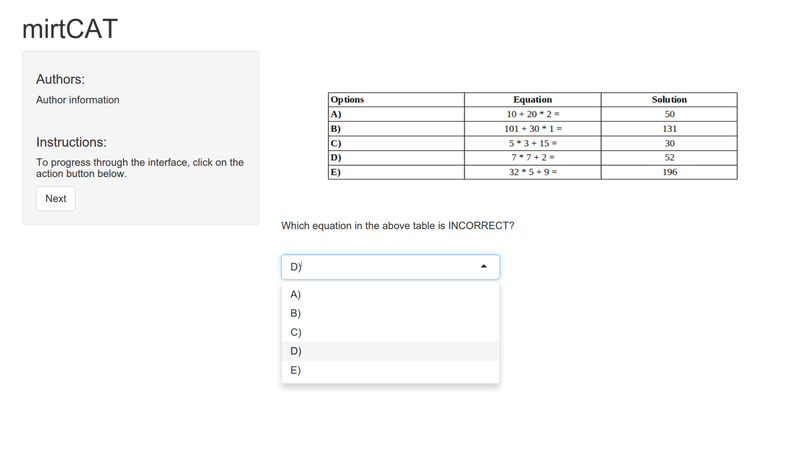 Provides tools to generate an HTML interface for creating adaptive and non-adaptive educational and psychological tests using the shiny package. Suitable for applying unidimensional and multidimensional computerized adaptive tests using item response theory methodology. Various examples and worked help files have been compiled using the knitr package to generate HTML output, and are available on the wiki. User contributions are welcome! To install the development version of this package, use the following code. Bug reports are always welcome and the preferred way to address these bugs is through the Github 'issues'. Feel free to submit issues or feature requests on the site, and I'll address them ASAP. Also, if you have any questions about the package, or IRT in general, then feel free to create a 'New Topic' in the mirt-package Google group. Cheers! switch multidimensional selection criteria to use analytical expressions rather than numerical. Several multivariate Fisher information matrix computation currently not supported analytically, but will be steadily added.